add whatever else you feel like adding! One thing about the office I can’t understand is how many people complain about their lunch, usually a frozen microwave thing that specifically advertises that it doesn’t have much in it. I can understand buying it once and complaining, but continuing to buy it and complain about how bad it tastes? A diet lunch that encourages you to eat out isn’t an effective diet. 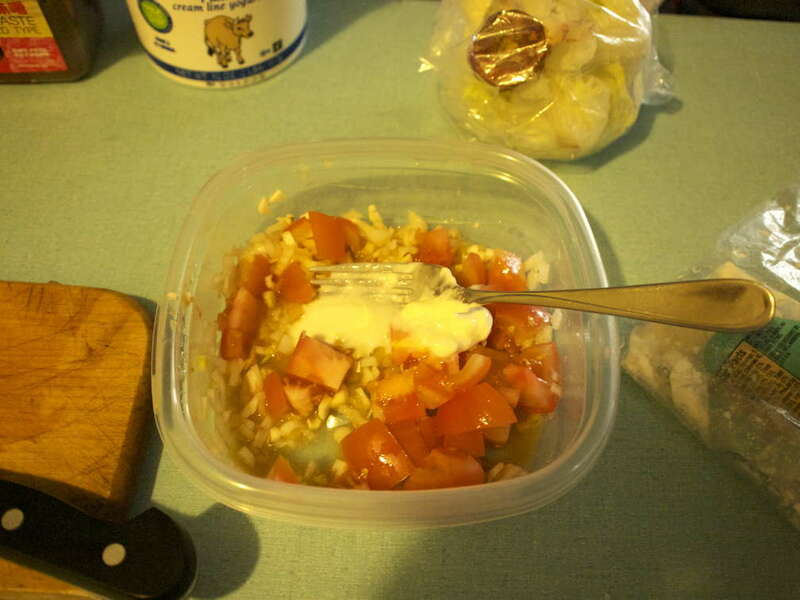 The stereotypical home-made diet lunch is the salad, but the home-made salad has a reputation for being unsatisfying. I think the main problem is our tradition that all salads must have lettuce. For a large salad for a bunch of people, lettuce is fine; for a lunch where you only have room in the lunch container for a limited amount of things, lettuce is too fluffy. By leaving the lettuce out, making a salad for lunch doesn’t have to be bland or empty or a dietary sacrifice. It doesn’t have to be a bunch of lettuce, carrots, and maybe a tomato if you’re lucky. A good, filling salad can make use of whatever vegetables you have lying around, some lemon juice, maybe some cooked meat, some canned beans, and something special to spice it up. For me, the “something special” is, besides the fresh lemon juice, just a touch of miso and some yogurt. This is really a variation on my Miso-yogurt dressing, but instead of making a batch of the dressing I just mix everything together in the lunch container. The roast chicken I usually use comes frozen, pre-cooked. All I have to do is open the package and toss in a few pieces. But besides roast chicken, I’ll instead often use frozen cooked meatballs. The frozen meats will thaw by the time lunch rolls around. Or, if I make some bacon for supper I’ll make an extra slice or two for the next day’s salad, and then chop or crumble that into the salad. It doesn’t have to have meat at all. A fresh zucchini, thinly-sliced, is great instead of or in addition to those things, and I’ll often throw in a half-can of sweet corn, olives, garbanzo beans, or black beans. Which can be with or without meat: you really can’t go wrong with garbanzo beans, feta cheese, and bacon. The other half of the can will wait for the next day’s salad, just like the other half of the lemon and jalapeño. If I have celery, cucumber, or mushrooms, I’ll use that, too. Whatever I have that sounds good goes in. If I don’t have the miso or the yogurt, then it doesn’t go in, but the lemon juice is important. Add the jalapeño, garlic, and onion to the salad immediately after mixing the lemon juice (and miso), and then chop everything else while those vegetables are soaking. This gives those sharper vegetables a chance to absorb the lemon juice and get “cooked” by it. 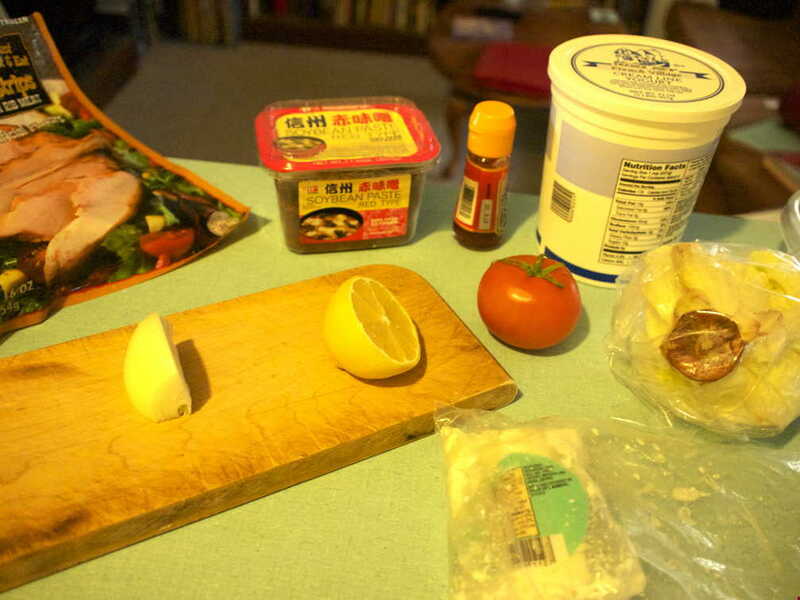 While the ingredients I’ve listed are the ones I try to have on hand, the photos are from the salad I made this morning; I didn’t have any jalapeño, so I added a bit more onion, and I put some hot sesame oil in with the onion. And I did have a little bit of lettuce left over from some cheese sandwiches a few nights ago, so I tore that up and put it in before it went too limp. I do like lettuce, even though I rarely put it in my lunches. It was still great, mainly because I didn’t have enough lettuce left to take away room for the other ingredients. I’m a big fan of feta cheese, but I’ve also used cheddar cheese, parmesan, gruyère, havarti, and others I happened to have that I don’t even remember. The sharper ones are usually better, just because it’s going into a salad whose base is lemon juice and miso and I almost always put hot peppers in it. So something like havarti is a final resort, if I want cheese at all. 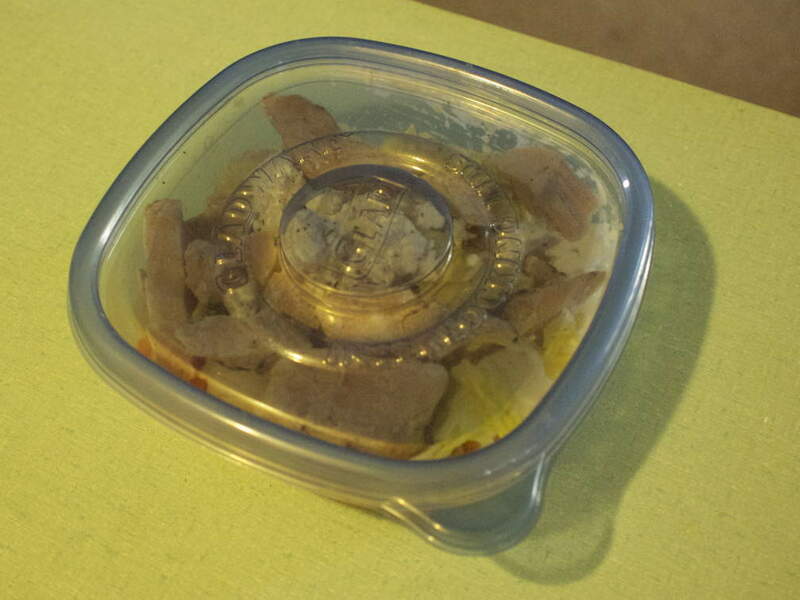 The salad will keep overnight, although being a procrastinator by philosophy I usually make it just before leaving. Then I put it in an insulated tote bag along with a small jar of ice kept in the freezer just for the tote bag. On rare occasions I’ll make more than one serving and put it in a larger container in the refrigerator; it appears to keep for four or five days, although I don’t ever let it last that long. How to make a lunch salad last modified May 5th, 2011.